England Versus Spain: Are Goals the New GDP? For some time now, a multifaceted debate has been raging in economics about the merits of Gross Domestic Product (‘GDP’) as an indicator of genuine value. While few would deny that, as a general rule, it is probably better to live in a high-income country than in one which is characterised by poverty, things start to get a little bit blurry when comparing the quality of life in countries whose average GDPs are less radically different. For example, 2010 data from the International Monetary Fund (‘IMF’) shows the United States occupying a lofty seventh place in the GDP per capita rankings with an average income of US$46,860.24, considerably ahead of nineteenth-placed Germany (average GDP per capita: US$36,081.29), yet given the incredibly polarised distribution of income in the former and the exceptionally good standard of living enjoyed by most people in the latter, few would posit that life for the average American even comes close to that of his or her German equivalent. In other words, the notion of GDP per capita does not capture the texture of life in a given country with that much accuracy: that many Americans are desperately poor, lacking health insurance, morbidly obese, chronically overworked and socially atomised is not something which could be gleaned from the figures. Various alternative indices – including the Human Development Index (‘HDI’), the Happy Planet Index (‘HPI’) and Gross National Happiness (‘GNH’) – have been proposed as more satisfactory quality of life measures, and have engendered some remarkable results: the 2009 HPI places most developed nations firmly in the middle of the index, with Costa Rica at the acme. Perhaps unsurprisingly, it turns out that working in the pursuit of more stuff is profoundly unsatisfying; there is much more to life than narrowly-defined notions of ‘success’. Is there an analogous argument to be deployed in the world of football? Watching this evening’s encounter between England and Spain – London’s Wembley Stadium was the venue for this sporting clash of civilisations – did make Mediolana’s blogger-in-chief wonder once again about the precise meaning of goals. Viewing the match through the lens of ‘results’, England scored a stunning victory over the current European and World Cup title holders, with one goal – nodded into the net by Chelsea stalwart Frank Lampard just after half-time – proving decisive. But this captured virtually nothing of the essence of a game where Spain were, for the most part, playing against themselves: with 71% possession and 21 shots to England’s 3, the Spanish gave an exhibition of controlled football which lacked only first-half urgency and tighter finishing. Up against what could generously be described as an 8-1-1 formation, even a supremely resilient central defence of Joleon Lescott and Phil Jagielka did not ultimately stop Spain running riot in everything but the scoreline. The history books will record a 1-0 victory for England. Is this really sufficient? One cannot help but be reminded of a similar game at a similar time of year back in 2005, when the English were – to use a refreshingly honest assessment from Ashley Cole, another outstanding performer from tonight’s match – ‘absolutely slaughtered’ by José Pékerman’s Argentina in a Geneva friendly, yet still ended up 3-2 victors in a tie that seemed to bend conventional theories about natural justice. More broadly, the Brazil sides of the 1982 and 1986 World Cups, the Argentina team of 1994, the Dutch pioneers of the 1970s and the ‘Magical Magyars’ of the 1950s all captured hearts without winning any official recognition to speak of. FIFA has a Fair Play Trophy that is given to the team with the best disciplinary record at the end of each World Cup: how about a measurement that can at least distinguish between high art and low science? An infographic recently published by that source of seemingly endless statistics, the Economist, is well worth a few moments of anyone’s time. The moderately interactive diagram depicts the 28 states (and most of the 7 union territories) that make up today’s Republic of India in terms of three variables: GDP, GDP per capita and population. For each of these variables, the Indian administrative units are paired with an equivalent country, so Maharashtra, an entity which is host to booming Mumbai, has the name of Singapore – the GDP of which it roughly matches – superimposed on its territory. 1. Wealth. At least in absolute terms, India is a land of fabulous wealth. GDPs of countries such as Qatar, Uzbekistan, Croatia and Tunisia represent but a fraction of the overall Gross Domestic Product of South Asia’s largest nation. 2. Poverty. Measured on a per capita basis, India is still beset by shocking levels of poverty. The average Maharashtran has an annual income of c.US$4,743.00 – slightly less than the average resident of war-torn Sri Lanka. Those in poorer states fare as badly as almost anyone else on earth: desperately impoverished Bihar is worse off in per capita terms than benighted Eritrea. 3. Potential. 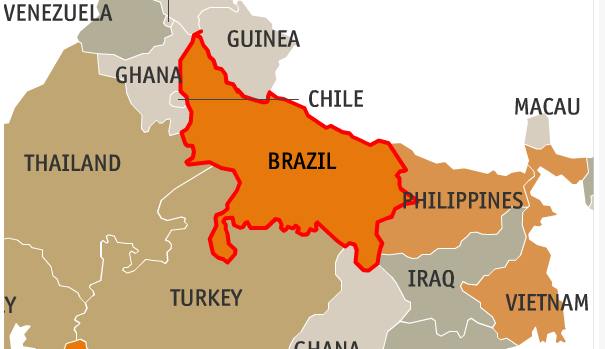 If Uttar Pradesh – a gritty industrial state in northern India – declared independence tomorrow, it would be the fifth-largest country on earth in terms of population, with its 195.8m people edging Brazil’s 191.5m. If India can somehow grow its economy on a meaningful scale – in particular, pulling society’s lower echelons up into its middle class – and in a sustainable manner, it could yet eclipse China in the race of the Asian superpowers. The Asian Century: 2027 – ? As economics continues on its inexorable trajectory en route to becoming the new football, this seems an appropriate juncture at which to introduce a new measurement that it is hoped will take its place alongside other indices of repute, such as Gross Domestic Product or the Economist’s Big Mac Index: the European Transfer Ratio (‘ETR’). The theoretical underpinnings of this ratio will be explained in a future blog post, but suffice to say that the amount of money flying between football clubs within UEFA at a time when most sane Europeans are concentrating on the more mundane goal of keeping warm says much about the state of the economy in this continent, as does the manner in which the cash is splashed. 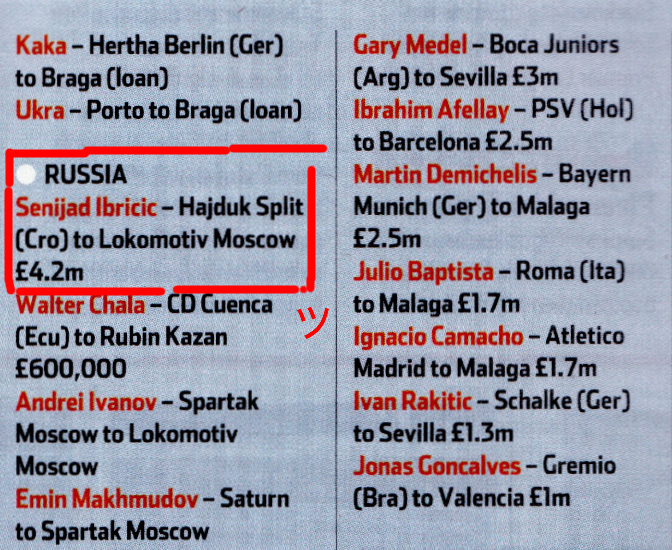 Arguably the most emblematic move of the 2011 January window – a transfer period which is lucidly recollected in the March 2011 issue of World Soccer, pictured above – is that of Senijad Ibricic from Hajduk Split of Croatia to Lokomotiv Moscow; indeed, in years to come, this ETR may become informally known as the Ibricic Index. In years gone by, Ibricic, a chunky midfield genius who is also a key squad player for the Bosnia and Herzegovina national team, would in all likelihood have been snapped up by a club in Western Europe. But after years of plying his trade in the unglamorous HNL, the only really serious suitors were from Turkey and Russia – and after Hajduk turned down an offer of €6.5m from Istanbul aristocrats Galatasaray in the summer of 2010, Lokomotiv stepped in this winter with an offer of €5m + 20% of Ibricic’s next transfer fee; with the poor economic outlook in Europe continuing, the Adriatic port city club were in no position to refuse these overtures. 3. A shift in power to the east. Clubs in large countries located in Europe’s East – such as Russia, Ukraine and Turkey – are now serious players in Europe’s transfer market. Two Ukrainian clubs – Dnipro Dnipropetrovsk and Metalist Kharkiv – lavished a total of £27m on just four players, while Turkish outfit Besiktas signed no less than three current or former Portuguese internationals: Manuel Fernandes (Valencia, loan), Simao Sabrosa (Atletico Madrid) and Hugo Almeida (Werder Bremen).